Shaun Hendy in his compelling Silencing Science (BWB texts) argues that “New Zealanders can’t be complacent. I believe that there are rifts between our scientists, our politicians and the public that put members of our society at risk.” His readable short text (128pp) takes examples from across New Zealand public life – from earthquakes, through folic acid in bread, to food safety scares – and looks at issues such as commercial interests that can silence scientists and the media’s role in communicating science whether it’s during a disaster or in public debate. Having read Silencing Science earlier this year, I was pleased to see two new science books for the general public on potentially controversial topics had hit the bookshops. And I was interested to see whether they might be bridging some of the rifts Shaun Hendy referred to in communicating science to the public. Protecting Paradise is a warts and all look at the use of the poison 1080 to kill introduced predators of New Zealand’s wildlife. The author, Dave Hansford, tackles this controversial topic, describing the history of 1080 use, problems with its use, the results of science studies, why people oppose it and why people are for it. Yet the book also ends up pleading the case for 1080, because that is where the studying the science has led the author (as it also led the Parliamentary Commissioner for the Environment, Jan Wright, in her 2011 report). It seems there is a lot to say about 1080 – this book runs to 318 pages – but it’s not a dry academic tome. Hansford’s journalism background ensures the book is very readable and it’s worth reading the book in its entirety. The book leaves no stone unturned when it comes to examining claims for and against 1080 and as a reader I was grateful for the author’s persistence in covering so many aspects. Readers who want to pursue some of the topics raised by Shaun Hendy in Silencing Science, will find chapter 12 “The Truth is Out There” which tackles anti-science sentiment and chapter 15 “Tipping the Balance” on journalism and science of particular interest. The author also explores some interesting territory about rural New Zealand, hunting and hunters, TB, the nature of science and conspiracy theorists. If there was one thing that surprised me and that was the belief that Hansford uncovered amongst some 1080 opponents that native and introduced species in New Zealand have somehow reached a balance, and that intervention was not required. As there are climate-change deniers, so it seems there are also deniers of the true state of our native wildlife populations. These deniers ignore recent and impending extinctions, whether complete or localised. In tackling this myth, Hansford addresses the alarming picture of what is happening to our wildlife population biology. This book is indeed about the “the fight to save New Zealand’s wildlife” and I found myself wanting to read more on this topic. As you would expect from a scientific title there are extensive endnotes that describe the sources, but these are so extensive I would have liked a “Further Reading” list which perhaps could narrow it down to publications that a general reader might like to pursue. 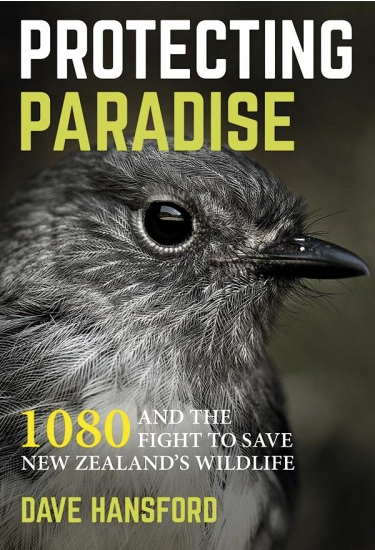 This book does an excellent job of communicating the science of this controversial topic, there is also a supporting website and free summary videos which cover the salient points http://www.protectingparadise.co.nz . According to the back blurb, No Place to Hide was born from the author’s realisation that he had no educated opinion on global warming and from the research he did to remedy that. This is an appealing premise for the reader, we expect and look forward to, being taken along on Jim Flynn’s own journey of discovery. It relies of course on our trust in Professor Flynn. He’s a well known academic and author but not a climate scientist, the ideal background for the task of explanation. And it doesn’t disappoint, Part A does an excellent job of sharing what the author has learned about the history of our climate. Maps and graphs illuminate statistics and I appreciated all the bold subheadings that helped guide me through the climate history. Publishers should never underestimate the role of book layout in guiding the reader through the topic and making things clear. Clear headings make it easier to find your place, glance back to get an overview of what you’ve read, and see what’s coming next. At times the author makes use of his learning journey to draw our attention to something that must have puzzled or confused him until he sorted it out. For example, in chapter 3 the emphasis on the difference between ‘sea ice’ and ‘land ice’ was a helpful clarification. And the direct approach using ‘I’ statements helps us differentiate between when he’s reporting on the research and when he’s uttering an opinion. Professor Flynn also tackles various arguments put forward by climate change deniers but sensibly doesn’t waste too much time on this, he let’s the facts speak for themselves. 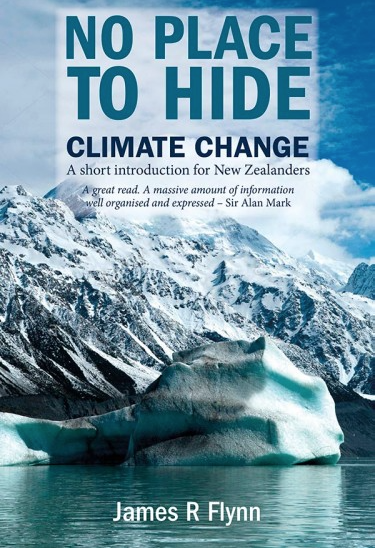 I like the way the author has tackled Climate Change as his personal problem and tried to shed light on it, though perhaps I found it a step too far that he was pushing a solution by chapter 8. And this is of course the rub, we trust him well enough to research and write ‘a short introduction’ but do we trust the solution he proposes given he isn’t a climate scientist? Still I’m grateful that he’s gone as far as describing solutions that have been put forward, and I look forward to climate scientists debating these in public. The author is clearly at home with statistics and mathematics, but unfortunately some readers won’t be. As the book progresses there is a danger that a ‘maths-avoiding’ reader will find their eyes glazing over as they encounter sentence after sentence full of figures, particularly when they get to Part B. In many places there are useful tables and graphs to explain the data. But there is no easy fix to this, the reader will have to take their time, as the author did, to come to grips with the information, or skip judiciously. All of these titles would be useful additions to senior school libraries and will be of interest to teachers of senior science and geography to use in their teaching programmes. For the general public who like to keep informed, put these books on your must read list for 2017. If you have time to only read one make it Silencing Science, once you’ve read that you’ll be compelled to read on! Silencing Science is published by Bridget Williams Books. Protecting Paradise and No Place to Hide are both published by Potton and Burton.